I need to go pick up my sister and her friends at the airport at the most inopportune time, at least from a beer-drinking perspective. But it's OK. I love her and see her infrequently. She and pals are here for a few days before going on a cruise. So you probably saw earlier I finished my Top Five list for last month, which required no new drinking. I'm sure you all get what I'm talking about. Don't drink and drive, and stay under control! 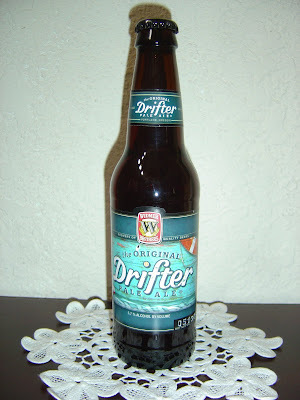 So this afternoon I'm going to just drink one beer, Drifter Pale Ale brewed by Widmer Brothers Brewing Company in Portland, Oregon. This beer was bottled on 051309. Doh! Yes, I've had it since August. But whatever, deal with it! Fruity citrus and hoppy aroma, with a faint touch of caramel sweetness. Light flavorful fruits start things off with lots of pear and peach and apple. There are some caramel flavors as well, but a good dose of hops balances things very nicely. Bready and yeasty on the back half of the beer. Medium body, medium carbonation. Crisp and refreshing, this is a very pleasant drinkable beer, and I'm sorry I waited so long to drink it! Try it when you can.